I just LOVE soup! You can almost turn everything you like into a tasty soup and it’s a fantastic way to add veggies and legumes to your daily diet. I can eat soup every moment of the day and every time of the year! I love a good bowl of soup on a cold winters day. Many people don’t like soup on hot days, but did you know it’s better to eat something warm when feeling heated then to eat or drink something chilled? Same thing when you’re feeling sick and you have a fever! If you drink/eat something really cold, you’re body will have to work hard to bring it to body temperature, this asks a lot of energy from your body, which you need so bad to become better (when feeling sick) and makes you feel even more heated after having the chilled goods. Especially when you are sick it’s best to support your body and immunesystem with the tasks their performing at that moment: making you feel better! When being ‘attacked’ by bacteria or a virus that’s makes you sick, the immunesystem comes into action and strikes back! Your bodytemperature will rise to create more immunecells and you’ll get sweatty to lose the waste and germs! So, when feeling sick you’d better surrender to it en support the processes going on in your body. That way you will feel better the fastest! 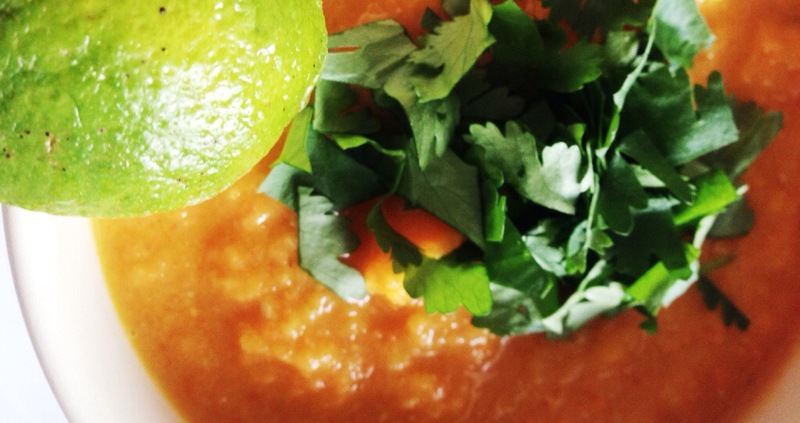 For this soup I used carrots and lentils as a base. The lentils make this a hearty dish and suitable for lunch, together with a side-salad or naan-bread (or a glutenfree, buckwheat flatbread) it’s even perfect for dinner! The lime used in the recipe gives it a refreshing taste! Preheat the oven at 175 degrees celcius. Heat 3 tbsp of olive oil in a soup pot and add the chunks of carrot. Let simmer for a few minutes, than put into a bakingtray together with the sliced garlic, limezest, limejuice and the cuminseeds. Cover with aluminium foil and bake in the oven for 40 minutes. Heat 1 tbsp of olive oil in the soup pot and add the onion and fry for a few minutes. Add the lentils, the ras-el-hanout, the bay leaves and the vegetable stock. Boil for 25 minutes until the lentils are done. Add the content of the bakingtray to the soup pot, remove the bay leaves and blend the soup. Garnish with the fresh coriander and a wedge/slice of the lime. 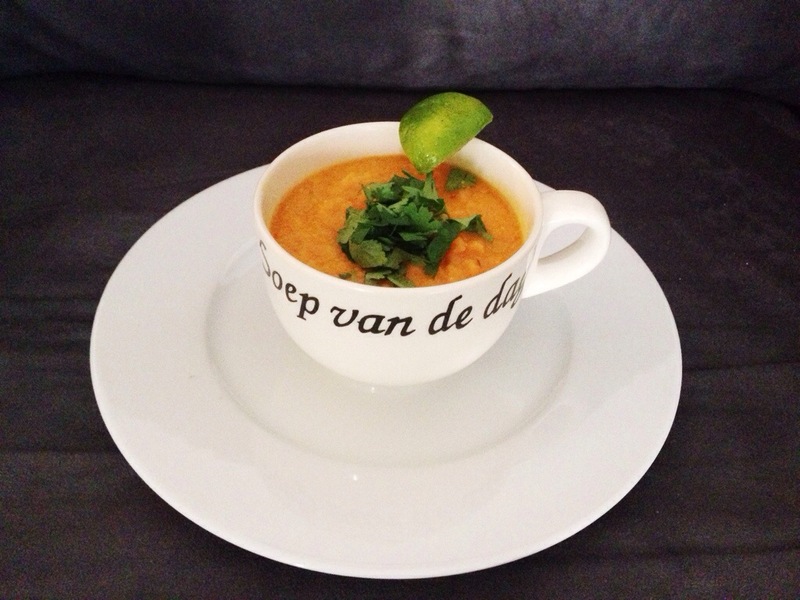 Posted in Diner, Lunch, recipes, Soup, VeganTagged carrot, dairyfree, dinner, glutenfree, healthy, herbs, legumes, lentils, lunch, recipe, roasted, soep, soup, soyfree, sugarfree, vegan, veggie, veggiesBookmark the permalink.